Spend more time fishing and less time steering with Garmin’s TR-1 Gold Marine Autopilot. This unit offers worry-free remote steering and speed control to operators of small gasoline outboard motor boats up to 20 horsepower. The TR-1 Gold is the first – and so far, the only – true autopilot designed to offer remote steering and speed control for small gasoline outboard motors. These capabilities allow you to focus on other things, like trolling, fishing, scanning electronics or simply moving around the deck. The TR-1 Gold can also be easily set to hold position against wind, waves or heavy current, enabling hands-free operation of your boat even in the most difficult water conditions. The Gold has a standard wired controller that can be panel-mounted near the outboard or used as a handheld portable remote. An optional wireless remote offers ultimate liberation with full remote steering and throttle control from anywhere on your boat. The Gold’s ability to automate your boat’s turns and maneuvers gives you quite an advantage when fishing. It's great for trolling. Press a button and a number of preset maneuvers can be selected, which is a useful feature when tracking fish that are swimming in certain patterns. The Gold can interface with any Garmin GPS or NMEA 0183 compatible GPS system for ease of navigation to selected waypoints or routes. The ability to perform GPS-interfaced patterns and non-GPS patterns offers added safety as well. The TR-1 Gold is compatible with most outboard motors, including Mercury; Mariner; Johnson Evinrude; Honda; Yamaha and Suzuki. Installation of the Gold will need to include components specific to your boat’s motor. Please contact your Garmin dealer for specific motor applications, options and accessories. 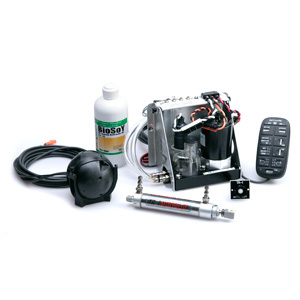 Note: Motor-specific kits such as the cylinder mounting and throttle control are not included in the Gold autopilot core pack and must be purchased separately to complete the autopilot system. Please contact your Garmin dealer for details.